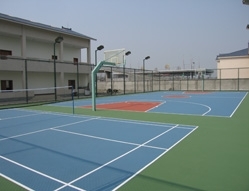 Four-coat system for old or new courts. The particularity of the COURTSOL COMFORT system lies in the application of Courtsol resins over a soft rubber mat stuck onto the surface. This system offers players maximum comfort, decreasing the risk of injuries. It is particularly adapted to multipurpose playgrounds.